Favored by athletes, body builders and many dieters, protein shakes provide essential nutrients and energy boosts for the body, whether downed post-workout or sipped as a meal replacement. The taste of commercially manufactured protein shakes and powders varies widely, ranging from frosty and milkshake-like in consistency to gritty and disgusting. 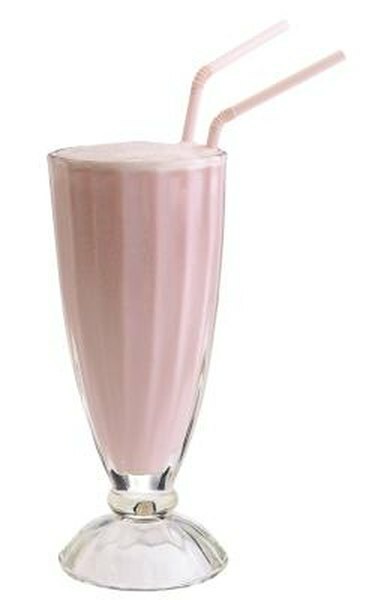 Decide which protein base you prefer and experiment to find a protein shake that pleases your palate. A by-product of cheese-making, whey protein is derived from the process of separating the whey protein from the lactose in fresh milk. The whey protein is then purified and dried into whey protein isolate powder. Toothsome whey protein powders for shakes include Designer Whey, Unjury brand and Syntrax Nectar Whey. The first two whip up thick and taste rich in both the chocolate and vanilla varieties, while the Nectar Whey comes in exotic flavors, such as fuzzy navel, twisted cherry and Caribbean cooler -- ideal choices for fruit smoothie fans. Remove most of the fats and carbohydrates from soy meal and you get soy protein isolate, which is about 90 percent protein. Neutral in flavor and less likely to cause bloating and gas due to the lower amount of carbs, soy protein isolate makes an effective base for vitamin and mineral-fortified protein shakes. Good-tasting soy shakes are available from the GeniSoy line, especially the GeniSoy Ultra, which blends into a thick and non-gritty shake, and the chocolate variety contains genuine chocolate flavor. Revival Soy is another option, not only for taste, but also because the powder comes naturally sweetened with fructose or unsweetened for those watching their carbs. Egg white protein powder is lactose-free and contains 100 percent protein. Products from Rose Acre Farms boast all-natural ingredients and an agreeably neutral flavor that blends well with milk or milk substitutes, fruit juices and frozen bananas. Muscle Milk is a combination of protein sources and its Cafe Latte and Vanilla Creme ready-to-drink varieties are best served cold. Another flavorful mixed-protein line is BSN Lean Dessert, especially the Whipped Vanilla Creme and Fresh Cinnamon Roll. With any protein shake you choose, whip the ingredients thoroughly to avoid clumping. The liquid should be ice-cold for best results -- throw in crushed ice or cubes made from milk or fruit juice to give the shake a slushy consistency. Frozen fruit adds bulk to a shake. A tablespoon of peanut butter, especially in chocolate, vanilla and banana flavored protein powders, lends richness and added protein.